St. Louis Mandarin immersion 很好! ST. LOUIS • The moment was brief but telling for Lydia Hsiuling Chen as she watched one of her students accidentally step on the foot of another as they headed out to recess. “Dui bu qi,” the kindergartner said quickly as she continued on her way. The classmate, looking slightly annoyed but accepting of her apology, muttered his reply, telling her it was OK — also in Chinese. It was a natural inclination to use what was an entirely foreign language to them less than two months ago. 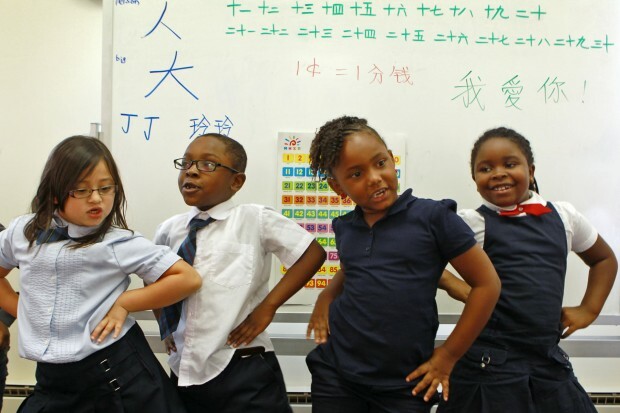 And it was an early sign of success for The Chinese School, the newest program that began this year at St. Louis Language Immersion Schools. “They are not just learning Chinese, they are living with Chinese,” said Chen, who serves as head of the school. It is the third language immersion program offered at the public charter school in the city. Schools that focus on French and Spanish are now in their fourth year and are popular, with total enrollment more than doubling from two years ago to about 800 students this year. The schools, which are tuition-free, have a waiting list and now a second campus.